Bridgewater, NJ- The Atlantic League of Professional Baseball announced Tuesday that Somerset Patriots second baseman Eric Farris has been named the 2016 Rawlings Gold Glove Defensive Player of the Year. This is the third honor for Farris on the heels of his impressive 2016 campaign; first-year Patriot was named to both the Atlantic League Post-Season All-Star Team and Red, White & Blue All-Defensive Team late last week. He is the first Somerset Patriot to ever win the award. Last year, Long Island Ducks shortstop Dan Lyons became the league’s first-ever Defensive Player of the Year recipient. "As a team, we always took great pride in our defense all season long," said Farris. "Brett put me in different spots throughout the year, and I just tried to help out as best as I could. It was definitely a great season!" The Major Leaguer appeared in a team-high 123 games in 2016, including 98 games at second base. He also appeared in 21 games in the outfield, four at shortstop and three at third base. 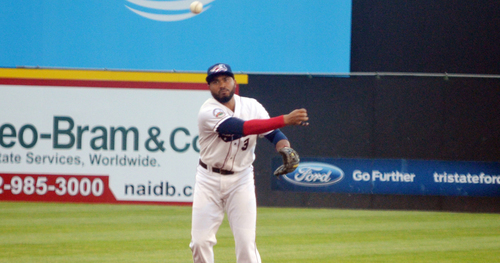 Farris led the league in fielding among second-baseman with a .988 fielding percentage. Additionally, the Sacramento, California native led the league in innings played at second base (857.2) and finished second in putouts (163) and assists (232) with only five errors. Farris committed only one other error in the combined 76 chances he got in the field at shortstop, third base and various outfield positions throughout the regular season. Overall, the 2007 fourth-round pick finished the season with a .987 fielding percentage. At the plate, Farris hit .301 with eight home runs, 66 RBI, 74 runs scored and 26 stolen bases. For more information, please visit http://www.atlanticleague.com.